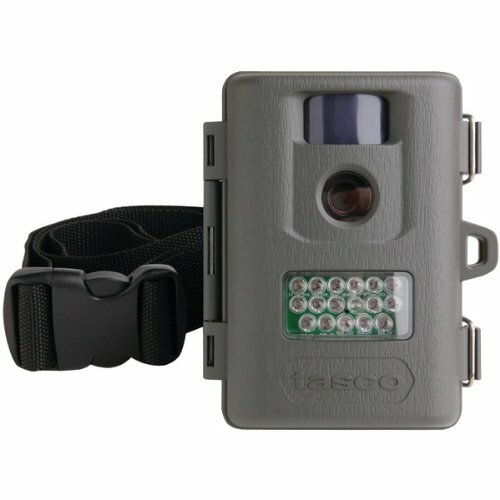 Tasco trail cameras are really popular because of they are inexpensive but packed with features and functionals. If you are operating on a budget then these trail cameras are ideal for you. Below I have put together a list of Tasco trail cameras that I believe are the best and will definitely meet your trail camera needs. This camera is a 3 MP trail camera that represents the most basic of trail cameras. This camera does not have a lot of the features found on most typical trail cameras, and the only selections you can make are the shooting mode (either still photos or video) and the resolution (either 3 MP or 1.3 MP). The Trail Cam with Night Vision has VGA video capability for both daytime and night time shooting. The 48 IR LEDs allow this trail camera to capture images at any time of day or night. The camera has a date, time, and moon stamp. The 3 MP Trail Cam with Night Vision has a flash distance of up to 35 feet, and the typical battery life is four months. The night vision on the camera helps to deliver clear images. For the price it is a camera that is fairly packed with features. The camera has a good range and has most of the basic features that you would expect a camera at this price point to have. The Tasco 3 MP Trail Camera is compact but gives the desired results, making it a good purchase. The camera has 3 MP during night time shooting allowing you to capture sharp photographs as well as mini video clippings whether during the day or at night. The Tasco 3 MP Trail Camera also features full-color high-resolution images, as well as an oversized flash that will give you increased range. The infrared sensor detects game up to 45 feet away, which is fairly impressive. The ease with which you can set up this device and the camera’s ability to operate all day makes it even more impressive. The camera has Xenon flash for night time photography as well as a time, date, and moon phase stamp on each image. The camera is rigid and is basically an all-weather camera. You can save your images on a removable SD card making it easy for you to download images. This camera definitely represents value for your hard-earned money. This camera is inexpensive option, and as such, with the features packed into it, represents good value for money. The camera has an extra wide security strap that will no doubt help to prevent theft. There should be a word of caution though, as the flash provided in this camera is somewhat different from LED IR flashes and not only impacts the battery life but may also alert subjects of its presence, and I would consider these things when making this purchase. This camera is actually the most expensive of the Tasco cameras listed here for review. One thing is for sure though: this camera is an absolute bargain in terms of price to performance ratio. 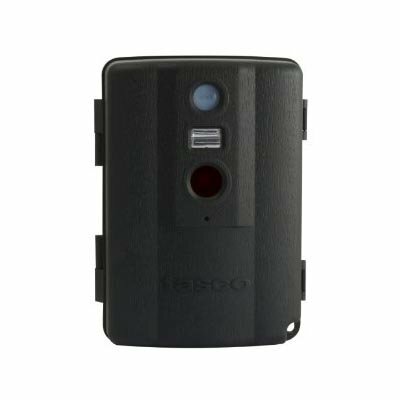 A main feature of this camera is the infrared flash that produces quality photos at nights. You will also be pleased to know that this camera is a hard nut to crack and this along with its ability to function in any type of weather makes it a worthwhile investment. The 5 MP Trail Cam with Night Vision has the ability to record up to 15 seconds of footage, and captures the time, date, and moon phase on each of the images. This camera, represents a great value for your money. As mentioned before, this camera is the most expensive of all the Tasco Cameras listed here. Notwithstanding, this is a very capable camera and it definitely gives value for your money, especially when you factor in its popularity among trail camera users. A word of caution though, the night infrared flash that could startle wildlife and the camera doesn’t capture footage much beyond 30 feet. Overall, this is a very capable camera that gives value for your hard earned dollar. The Tasco line of trail cameras competes directly with the original Primos Truth Cam 35. However, I must say I would give the edge to the Tasco line based on the fact that the night time images are in full color. There is no doubt that these cameras are a really good option if you are on a budget even though they only offer basic features. I would say the Tasco line of trail cameras is an excellent start for someone just beginning to use trail cameras. Yes, this is the definition of an entry level trail camera, therefore the basic features are justified and for the price range, they represents value for money. My favorite of the three listed here is the 5 MP Trail Cam with Night Vision based on its performance capabilities and price. If you are on a tighter budget, the Tasco 3 MP Trail Camera is a good option.